The sight of dozens of Muslim pilgrims doing their sundown prayers in front of the Mecca branch of Burger King in order to be the first to break their fasts with a Whopper during Ramadan tells me that it's a bit more complicated than American hegemony invading another innocent land. I traveled to Saudi Arabia in September and October with a tour group from Iran. Pilgrimage is a year-round business in Mecca and Medina, not just during the week of Hajj, the annual religious observance in which millions return to Mecca. We were on an Umrah Hajj, or "Hajj Light" as I called it, which includes most Hajj rituals and allows a lot of free time, but limits movements between the cities of Mecca, Medina and Jeddah. In a country where many things are forbidden (alcohol, cinemas, live music performances) finding activities to fill that free time can be challenging, especially for a less than practicing Muslim like myself. Except perhaps for shopping or indulging in American fast food. Our leaders were a Shiite cleric and a low-level Iranian official, both from the city of Mashhad. Our group included 150 or so middle-class Iranians, and it was through that lens that I experienced the birthplace of Islam. After spending many months in Iran during the past five years, I believe that we in the West have misguided notions about the Middle East. So I assumed that all Middle Eastern countries were getting a bad rap. Since the Iran I experienced had been a more livable country than most in America are ready to believe, I thought Saudi Arabia would also surely shatter the misconceptions unfairly ascribed to it. So I thought. Americans believe Saudi Arabia is a wealthy country, but the streets aren't exactly paved with gold or clogged by countless Rolls-Royces. As the home to two of the world's most lucrative enterprises — oil production and Islam — these riches are not filtering down to the masses. Much of the country is dilapidated. For a society closed off to the rest of the world in so many ways, there are many signs of Western life. American fast food joints and stores like The Body Shop are everywhere, even close to the holy shrines at Medina and Mecca. In Medina there is a Starbucks at one of the gates of the Prophet's burial site, while in Mecca the best plots are reserved for Burger King and Dunkin Donuts at one end, and on the other there is an Intercontinental Hotel that towers over much of the rest of the city, and looks down onto the courtyard of the House of God, presumably the holiest place on Earth. The common reaction when I recount these things to American friends is, "No wonder they hate us." But this lets Saudi Arabia off the hook too easily. Saudi Arabia is the least informed and least curious place I have ever visited. Perhaps since reaching Mecca and Medina are the height of what it means to be Muslim, their inhabitants feel no need to look beyond their insular world. More likely, though, I think their options for self-expansion are entirely limited. Finding an Internet connection or a local who speaks English can be extremely difficult. While neither is an absolute prerequisite for a worldly existence, one would assume that in two of the world's most visited cities, you would expect both to be omnipresent, especially given all the American products from Big Macs to Frappuccinos. Islam and consumerism appear to go hand in hand. Shopping has become the primary vice for many Muslims, and pilgrimage trips by Muslims from all over the world allow plenty of time to partake in faith-based shopping: buying trinkets in the holy cities. Few of the shoppers care to consider that the vast majority of souvenirs sold are made in mainland China. One aspect of Saudi life that Americans do have a developed understanding of is their deplorable treatment of women. It is as though females don't exist in public life. They cannot hold jobs where men are present; they are not allowed to drive. The only thing I did see women do in public was shop. When dining in a restaurant, they are segregated from all nonrelated male patrons. None of this repression would fly in Iran, another country with a reputation for the mistreatment of women. I was surprised when a Saudi man told me all citizens don't agree with these principles. In a hotel coffee shop, he began a conversation by telling me about the backwardness of his government. Dressed in the long white traditional Arab robes, he explained how he had taught at Texas A&M in the 1970s and wished that he could bring home some of the values he learned there. "For example, women should be allowed to drive," he told me. "There is a set of rules that dictates how we should drive, and there are punishments and consequences for people who break those rules. Why can't women be subject to the same?" Unfortunately, I can't comment on how Saudi women feel, because in two weeks there I didn't have a single opportunity to speak with even one. We were briefly detained and released but our videotape was confiscated. The police officer said he was sorry, but rules were rules. He understood we were tourists, he said, but what if these images got out? He gestured toward a cityscape of Chili's and Applebee's. "Haven't you heard what is happening here? What they are doing to us? We must protect ourselves." Unconsciously, the officer expressed the contradiction underlying Saudi society. 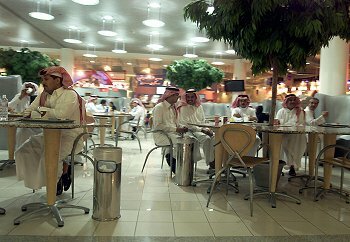 Saudis want it both ways: They want Western food and fashion, but they also want to believe that in their strict interpretation of Islam, they have something more valuable to the world than oil. In pursuit of the latter, they try to isolate themselves from the evils of modern life. But it's the wrong moment to draw inward, and far too late. View the Worldpress Desk’s profile for Jason Rezaian.